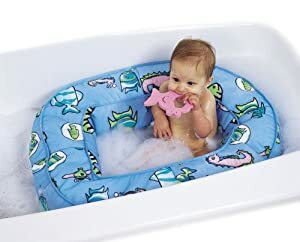 Baby bath tubs are great for parents because they’re quite smaller than the regular bathtub & they are portable, so they would be able to bathe their babies in a much easier way. 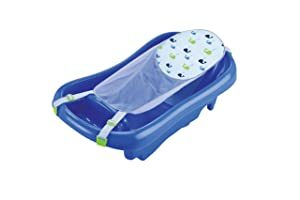 These contraptions are also great for babies because it will immerse their bodies in soothing water and it will let them enjoy a fun bath with mommy or daddy. This is a miniature, plastic version of any full-size bath tub. While it usually doesn’t have any additional features, this one has a curved design that would allow your baby to lie down and relax comfortably. This type of baby bath tub will be able to hold your baby up, while you clean him with your hands. It will keep the baby buoyed or half-submerged in water as you support him and clean him. This one will be able to provide service for newborns, infants and toddlers. These convertible types of bath tubs can be adjusted to various positions that would help you slide your baby in the tub comfortably. This interesting type of tub does not hold water; instead, it can be fitted into a regular adult bathtub and the water will just seep through the fabric, making it a bath tub within a bath tub. These ones do not take up space when they are not in use because they can be deflated. However, it sacrifices its durability, unlike hard, plastic ones. Still, this one could hold water and your baby without any problem. 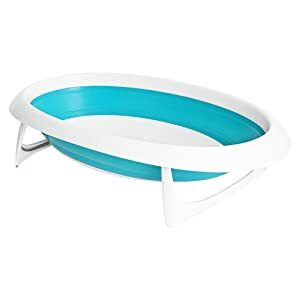 While most types of baby bath tubs take up much space in your bathroom or storage, this one can be folded and adjusted whenever it is not in use. It would be great for traveling. This type of baby bath tub is more complicated because it has a lot of bells and whistles. It can feature buttons for many functions like a water swirling mechanic, a bubble maker, and a soap dispenser. It can even have its own shower head. These contraptions are likened to the shape of a bucket, rather than an actual bathtub. 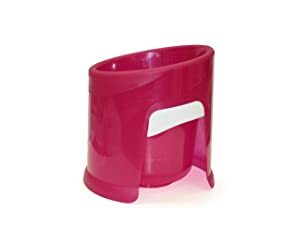 It is small and can support water and a baby that’s positioned in an upright manner. For ages 0 – 24 months. This one is a standard baby bath that can provide your baby with adequate support for the arms and legs because of a unique interior design. You can lay your baby down or sit him up and he will be secure. This one is a very popular choice when it comes to baby bath tubs that have adjustable harnesses. It can hold children up to the toddler years. You just have to adjust the straps of the harness, or completely remove them in order to accommodate your child. This one is a very modern take of bath tubs. It has a digital thermometer that will tell you how hot the bathing water is, a padded headrest and a mechanism that would allow you to adjust the tub the way you want. This model has a much simpler design, but it is effective in its purpose. You can fold it so that you can place it in a storage area and not let it take too much space. It also has a hook you can utilize if you want to maximize your house’s space. This one has a yellow duck design that your kid will enjoy. It is sturdy and will be able to responsibly hold the water and your baby without worry. 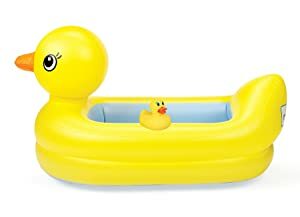 It also comes with a rubber ducky for your child to play. This bath tub has a colorful foam construction that will be able to absorb water from your adult tub. It will provide a comfortable resting environment for your kid whenever you will take him for a bath. It has a hanger for drying, as well. This bucket-type tub will be able to accommodate babies up to 6 months. It has a plastic outer frame that will provide the much-needed balance whenever it’s baby’s bath time. Water – baby bath tubs aren’t too deep. You may be able to fill one up to the brim, it will still be shallow enough to accommodate part of your baby’s body, but not all of it. Size – Most bath tubs aren’t too big, so the portability can be appreciated. Most of them also fit single sinks, so you can bathe your baby in your kitchen if you wanted to. 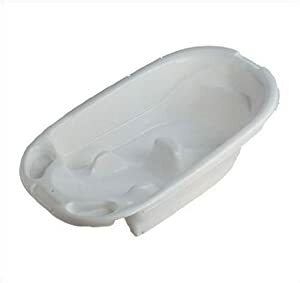 Water drainage – There are some baby bath tubs that feature plugs and drainage holes, which can be found on the base of the tub or the wall. Otherwise, you’ll have to throw the water away through the edges. Temperature Meter – Cheaper tubs have stickers that change color if they are exposed to different temperatures of water. The pricier ones have digital thermometers, which are more accurate. Hefty-sized bowl – You can use this one if you are on a budget or if your baby is still small. With adequate support for your baby’s safety and security, this one can be all you need while he’s small. Bucket – You can use this one because it is what bucket-type tubs are based on. You’ll be able to save money and put more use to another item in your house. Sink – if your sink is clean and free from clutter, then you will be able to turn it into a makeshift baby tub. Laundry Basket – This will become a repurposed cushion baby tub. It will have walls and a base that will hold your baby. The baskets holes will allow water to go inside it with ease.